(Newser) – If police reports are to be believed, Michael Flaig is a bit of a dirty fighter. 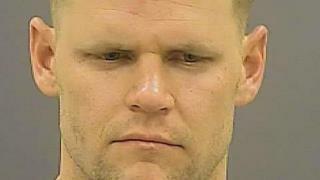 As the Baltimore Sun reports, Flaig, a 31-year-old Anne Arundel County cop, has been charged with assault after a bar fight Tuesday that police say ended with Flaig, who was off-duty at the time, biting another man's testicles. Flaig's victim, who's not named, told cops that Flaig was groping his female roommate; he says he told Flaig to stop and began walking home. Flaig then allegedly jumped the victim from behind and the two fell to the ground; when the male victim straddled Flaig to prevent him from leaving, he says Flaig bit his groin. Aw, Nuts - Ah, Nuts Spelling Is Crucial ! ! !